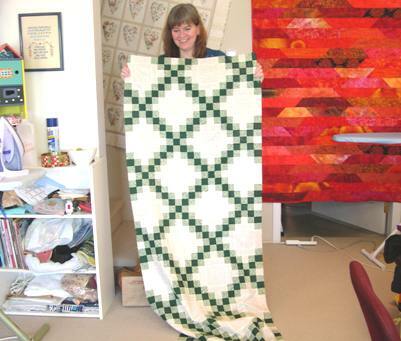 This Double Irish Chain Quilt is one of the classics! It looks fabulous as a simple two color combo (I've used navy and white) or with a third color inserted in the center of the "chains". Although it looks complex, this pattern is simplified by creating strip sets to complete your blocks. With so many seams, accurate sewing is a must in order for all the blocks to fit together properly. It is a wonderful design for showing off your quilting skills. 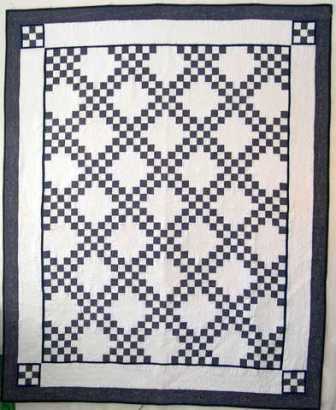 You have a large center portion in which to quilt a lovely motif design. This is a one day class. In 6 hours you will make several strip sets, and have a finished sample of each block to take home with you. Contact Me for more information or reservations. Finished with "Double Irish Chain Quilt" Return to "Classes I Teach"